Land reform is and was a concept of independent India. The origin of land reforms is to be traced back when the British rulers maximized revenue collections to fulfill their selfish desires. To address this burning issue on land reforms, West Bengal Government enacted Land reform Act in 1955. More details on Land reforms have been placed on their site known as Banglarbhumi. Banglarbhumi is a website about Land reforms, RS LR Plot Information, Khatian & Plot information in West Bengal and India at large. The leading state in land reforms in West Bengal. The West Bengal State has been able to distribute 23% of the lands in India and other beneficiaries in other countries at 53%. It has also documented more than 15 lakh Bargadars or a Sharecropper which is a breaking record because it has not been done anywhere else in the country. West Bengal has also been able to distribute homestead land to more than 5.6lakh beneficiaries. There is more than 30 lakh patta holders in that state. All these information can be found on their website at banglarbhumi.gov.in and also the West Bengal land records department. On the home page, place your cursor on a tab of “Citizen Services” and a sub-menu will appear in the Citizen Services tab. On the sub-menu, there are many options but click on the ‘RS-LR plot information’ option. On the LR-RS page, you will have to fill relevant details under the Mouza Identification i.e Choose the District, Block, and Mouza. Carefully select your district name, block name, and Mouza name. There are two options one is that you can use the Sabek Dag->Hal Dag(LR PLot No.) or Hal Dag->Sabek Dag(RS PLot No.). Enter any of the plot numbers and click on the submit button. All the information required will appear on the screen. 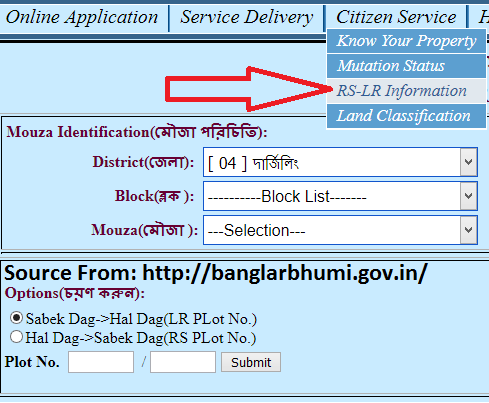 The above guidelines are the detailed procedure about on who are searching the data regarding the Banglarbhumi RS LR Plot information those citizen can read the above guidelines. How use this web site banglarbhumi.gov.in.